Whoomp! 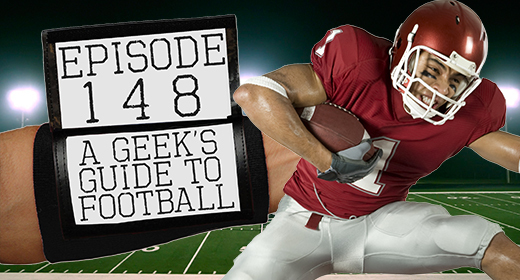 There it is….a geeky guide to football for this week’s episode of the podcast. This episode is for all of you geeks out there forced to go to Super Bowl parties, talk about sports at the office, and put into situations where you wouldn’t know a first down from roughing the passer; it’s our geeky guide to football! This week the guys talk about the basics of football, so that all of you geeks out there are ready for the big game, Super Bowl XLIX, on Sunday, February 1st. The guys talk about your #TweetTheGeeks answers, and get into the basics of America’s grittiest sport. After the break, the guys also talk about some geeky ways you can pick up and get into sports for the first time. Don’t miss their helpful hints! Also don’t miss That’s My Jam!, and our horrible attempt to sing a beloved 90’s classic! Also, make sure you check out our new partners for 2015: lynda.com! Visit lynda.com/justusgeeks, sign up for a 10 day trial that you won’t regret, and do something great for yourself in 2015! Melissa Faulkner liked this on Facebook. Debbie Daniels liked this on Facebook. Cheryl Palmer Palmer liked this on Facebook.